Be sure to check out our older posts on the right. Welcome to my Home Recording Studio Blog. I hope you are here to get ideas for your studio build, so I will do my best to describe what I’m doing and why. My basic goal is to build a studio in my garage for as cheep as I can, knowing I don’t have the best location for this build. Which is a rectangular garage with loads of parallel surfaces to overcome. Many of you will understand that building a studio is more like walking up a set of stairs and not one big leap and you’re done. With each step you will do “something” to improve your studio. ”What this is not”… it’s not an analysis and guide on the electronics of your studio. There are plenty of websites to help you there. So I hope you enjoy and can learn from my build, weather it’s something you want to incorporate or something to avoid. So if I make mistakes, you can learn right along with me, and hopefully there will be some good emails with comments I can post. The time has come to build a home recording studio. Currently I have a small studio that I have really enjoyed using and I have recorded lots of stuff in there, but it is only one room of my house and recording a band is out of the question… at least not all at once. I’ve used my studio mostly for personal projects with some buddies of mine and a few solo projects for other friends. But just wanting a bigger studio is not the only reason for doing this; it’s not even the main reason but a nice “perk” to the main reason. The reason is my oldest son age 11 and his younger age 9 are sharing a room together and this “needs” to change. So my oldest gets my current studio and I get a new studio. You need to know this will be a multi-phase build because of money and a possible lay off from my employer. Unfortunately way too many of you can relate to that. So I’m loosing my current studio to my son, but gaining a new bigger studio. 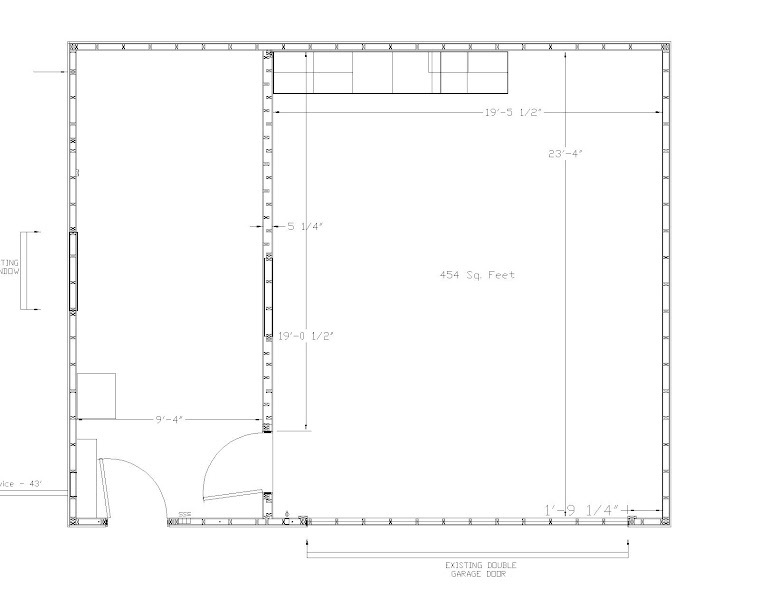 However, I have only one other location to built my studio… in my garage! This will be a true “Garage Studio”. Ten years ago I built a 720 sq. ft. detached garage with a double wide garage door and shop area with ten foot ceilings. (see fig 1) Now after careful consideration I will transform this car and junk storage area into a workable studio. Like many of you, I have to use what I have and a perfect studio with unlimited funds, are only dreams. 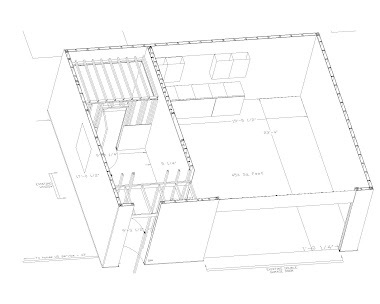 So over the next year or so I will be prepping my garage for a studio build and trying to overcome the obvious problems a rectangular building has to offer. So, to go from piles of junk, and a garage where the sound leaking walls; to a noise free oasis that inspires creativity is going to take some hard work and creativity. Right up front I’d like to tell you about my intentions and to for you to know that I’m NOT trying to create a perfect studio. I just don’t have the money. I mean if I were to win the Powerball or Steve Jobs gave me a grant, then this is all a moot point because I would have a real studio built for me and not in my garage. So I will tell you what I’d like to do and how I intend to do it. I’m also not going to dwell on the “equipment” part of my studio but, I will at least tell you what I have and how I intend to prepare for more equipment. I own a Digidesign 003 pro Tools 7.4 rig (soon to be upgraded "yea"), Mackie 824 MKII near-field speakers. I use a PreSonus DigimaxFS mic pre via Firewire and I have an assortment of cool mics. I also have a midi keyboard and various plugs for my ProTools. I also use a Furman headphone system that uses Cat 5 wiring. Not a big or expensive rig but it does the trick and, as always, it is a never ending process to acquire new equipment when the need arrives. For the future I plan on another 8 channel mic pre, outboard compressor/gate reverb/delay and who knows what else. I'm 54 and I've been playing music since I was in 4th grade. I attended the University of Colorado in 1980-1984 for Music Education. I studied recording engineering at FTM studios in Lakewood Colorado. 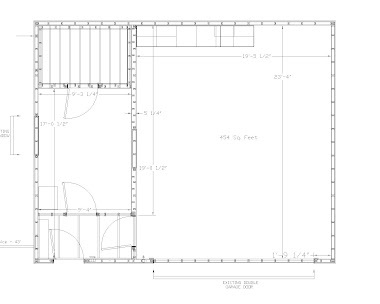 Garage with Main wall between the Control room and studio showing. (Phase 1) And as it goes... subject to change.